Per seller, the boat is in excellent condition. There are a few scuffs on the hull consistent with the age of the boat. A custom Seadek floor has been added as an upgrade. The Trailer is a 2013 Ramlin. It was custom made for the boat and features: 4 Wheel disc brakes, Dexter axles, Fulton 2 speed crank, Fulton jack, led lighting, spare, & pin stripping Stock #131750 Stunning Chaparral 224 Xtreme! Volvo Penta 5.7Gi, Trailer. Loaded and ready to go! If you are in the market for a bowrider, look no further than this 2012 Chaparral 224 XTREME, just reduced to $56,000 (offers encouraged). 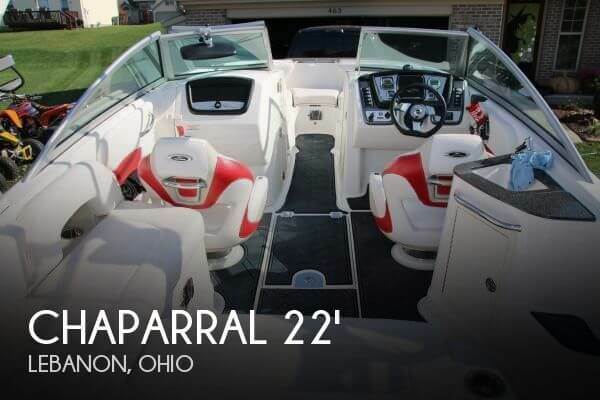 This boat is located in Lebanon, Ohio and is in great condition. She is also equipped with a Volvo Penta engine that has only 113 hours. Reason for selling is not using enough. 2012 Chaparral 224 XTREME A head turning, 2012 Chaparral 224 Xtreme with one year of warranty left. Includes some key features for not only the wakeboarder, but also the family/entertainer. For wakeboarding, it has Zero Off Speed Controll, ballast, an upgraded sound system (controllable from 3 different areas), and upgraded Wakeboard Arch. The Arch provides a ton of shade with included bimini top. LED accent lights inside and outside of the boat provide lighting options. Inside you will find a super large bow that can be filled in. Tons of storage under the seats and a extremely large ski locker. Midship you will find a bathroom with a Porta-Pottie. Includes a grill that attaches to the back and a table that can be mounted in three different areas. There is a onboard water that can be use at the bow and stern, as well as a sink midship. Included is a cooler that nestles under a seat. The Volvo Penta 5.7 GI provides 300 fuel injected hp, and is nestled in an engine compartment that leaves room for whatever you need to do. A recent stylish addition is a customized Seadek floor. To finish if off, a custom trailer with dual disk surge brakes. 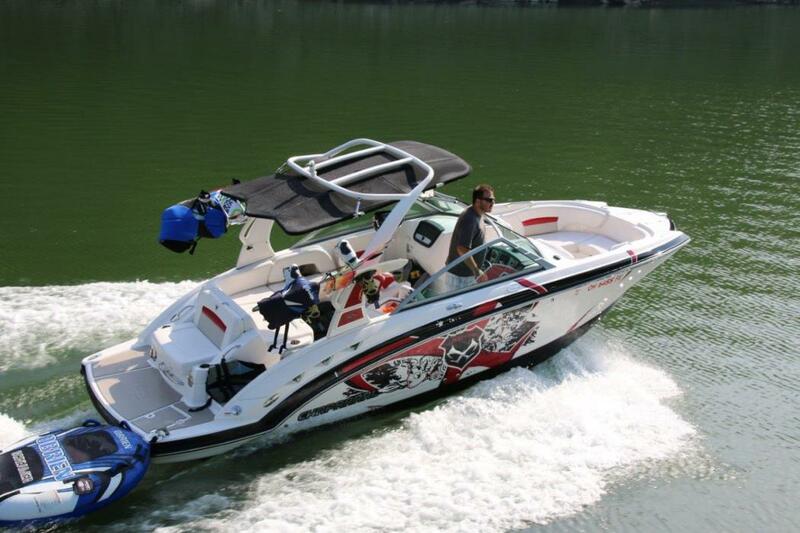 You wont be disapointed by this Chaparral 224 Xtreme. Measurements Length (feet) 22.33 Length (LOA w/ swim platform) 22 ft. 4 in. (6.81 m) Beam 8 ft. 6 in.  (2.59 m) Bridge Clearance With Arch Tower Upright: 9 ft. 5 in. (2.87 m) With Arch Tower Folded Down: 8 ft. 4 in. (2.54 m) Draft (max) 35 in. (89 cm) Draft (drive up) 20 in. (51 cm) Deadrise 18° Weight 4,150 lbs. (1,882 kg) Engine & Drivetrain Engine 300 hp (239 kW) Fuel Type Gas Fuel Tank Capacity 50 gal. (189 l) Drive Type I/O Operational Water Capacity 10 gal. (38 l) Maximum People 12 or 1,750 lbs. 2001 Sea Ray 190 Sundeck Beautifully maintained 2001 Sea Ray 190 Sundeck. 600.4 original hours on 240hp Merc 5.0 EFI with Alpha1 Drive. Perfect for skiers, tubing or family recreation. Comfortably seats 8, with room for more. Tons of forward and aft storage. New Interstate battery, new prop, new Skeg guard, new ignition, new OEM cabin and forward covers. Bimini top w/Sea Ray cover and snap-out carpet included. 3rd owner. Boat always fully serviced and winterized. Maintained indoors during off-season. Always freshwater...most recently at Lake Waynoka, OH for the past 6 years. This one needs nothing. Load her up, drop her off and turn the key!! 2002 matching trailer included. 2003 Regal 2665 Commodore. 2003 Regal 2665 Commodore Model in great condition- This gently used Boat only has 195 Engine Hours on it- The FasTrac Step Hull design makes the Regal 2665 faster better handling and more fuel efficient than other Mid Cabins- Powered by a MerCruiser 350 MAG MPI fuel-injected 300 Horsepower engine with Bravo III Duo-Prop Outdrive- Equipped with Bennett Hydraulic trim tabs and full Faria instrumentation.. One of the larger trailered Cruisers available- It has a well-proportioned Mid-Cabin that includes a changing area and a Queen-size Berth and the wrap-around convertible salon is light and airy with all the amenities for comfortable cruising including Marine Air AC.. The Galley features a Granite-Style countertop with Ceramic top one-burner stove molded sink refrigerator and lots of storage- A full stand-up head compartment includes a head vanity storage and shower.. On Deck the large comfortable helm station offers a double-wide seat with flip-up bolsters and 2 large storage drawers underneath a wood grain wheel with tilt action and non-slip grips- The Deck area has a large bench seat and a flip-down transom bench seat that folds flat for sunning- The foredeck has a large cushion for sunning as well and there's a large extended swim platform with ladder storage bin and transom shower.. Extras include dual batteries with a 10 amp charger Guest 30 amp galvanic isolator Sea-Fire automatic engine compartment fire extinguisher freshwater and holding tank level indicator and a remote spotlight.. For Entertainment there is a Kenwood stereo CD with cockpit speakers transom and cockpit remotes power amp and CD changer- Cockpit cover and Bimini Top with canvas in good condition- The bottom has Epoxy paint and will not blister.. This Boat has been very well maintained and if you're in the market for a cruiser of this size it could be the perfect Boat for you- Included is a matching Black Dual-Axle Trailer with a Spare tire and Carrier- This is a must see Power Boat and everything works well- Serious inquiries only. This Vessel is currently located in Lebanon OH.- Qualified Buyers may be eligible for Financing Nationwide Shipping and Extended Warranties.